For the first time in seven years, the global economy outperformed expectations and the result was solid returns for Global ETF portfolios held by Canadians. At the end of 2016, the consensus among global strategists was for quite modest equity and bond market returns, consistent with consensus views that the US Fed would push up interest rates, thereby depressing expected bond returns, and skepticism that newly-elected President Trump could get his election promises through Congress, depressing expected equity returns. 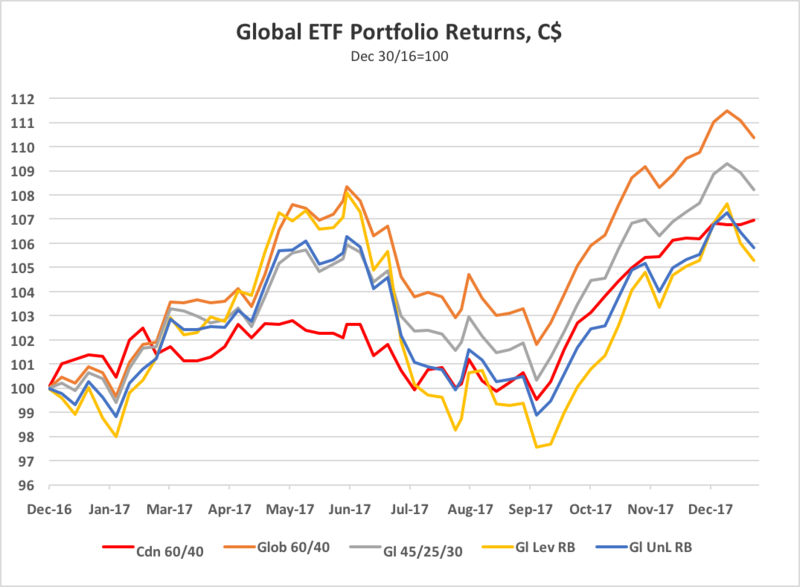 Since we began monitoring our Global ETF portfolios at the end of 2011, we have found that the global portfolios have all vastly outperformed a simple all-Canada 60/40 portfolio. In 2016, we saw a reversal, but the trend resumed in 2017. A stay-at-home Canadian investor who invested 60% of their funds in a Canadian stock ETF (XIU), 30% in a Canadian bond ETF (XBB), and 10% in a Canadian real return bond ETF (XRB) had a 2017 total return (including reinvested dividend and interest payments) of 7.0% in Canadian dollars. This was half of the 13.9% gain generated by the same portfolio in 2016. Two of our global ETF portfolios outperformed the all-Canadian portfolio, while two others underperformed. In 2017, with the CAD appreciating almost 7% against USD but depreciating almost 6% against the Euro, the best global ETF returns for Canadian investors were in global equities. The worst returns were in US bonds. 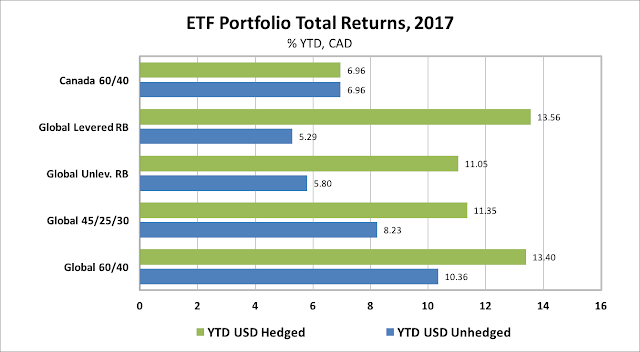 The chart below shows 2017 returns, including reinvested dividends, in CAD terms, for the ETFs tracked in this blog. The returns are shown for the full year (green bars) and for the "Great Unwind" period following a coordinated move by central banks in early-June to signal a reduction in the extraordinary monetary ease that had been in place since the Great Financial Crisis of 2008-09. 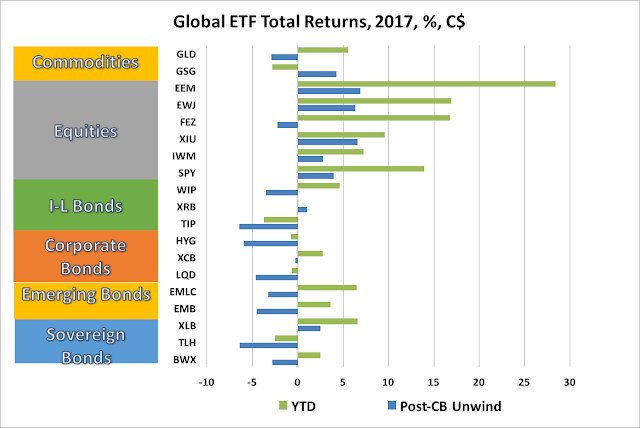 Global ETF returns varied widely across the different asset classes in 2017. In CAD terms, 14 of 19 ETFs posted gains over the full year, while 5 posted losses. The best gains were in the Emerging Market equity ETF (EEM) which returned a robust 28.4% in CAD terms. The Japanese Equity ETF (EWJ) was second best, returning 16.9%, followed closely by the Eurozone equity ETF (FEZ), which returned 16.8%. The S&P500 ETF (SPY) returned 13.9% in CAD terms, while the Canadian equity ETF (XIU) returned 9.6%. The worst performers were the US Inflation-linked government bond ETF (TIP), which returned -3.7% in CAD terms. Other losers were the Long-term (10-20yr) US Treasury Bond (TLH), the US High-Yield Bond (HYG) and the US Investment Grade Corporate Bond (LQD). The losses on these bond ETFs occurred in the period of the Great Unwind. 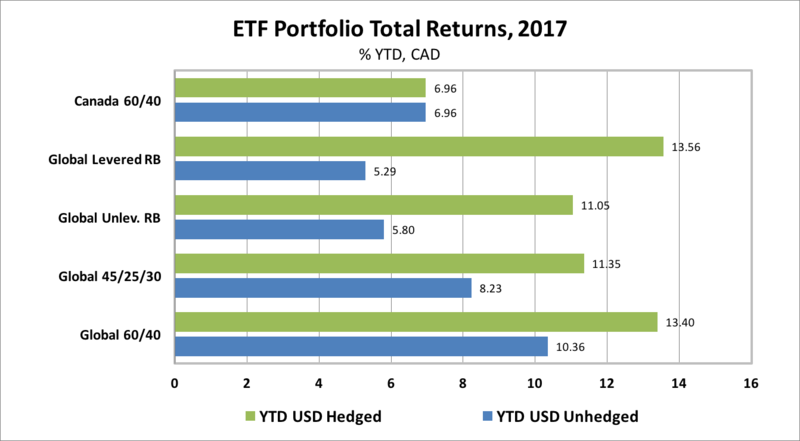 In 2017, the global ETF portfolios tracked in this blog posted solid returns in CAD terms when USD currency exposure was left unhedged and even stronger returns when USD exposure was hedged. In a November 2014 post we explained why we prefer to leave USD currency exposure unhedged in our ETF portfolios. A simple Canada only 60% equity/40% Bond Portfolio returned 7.0%, as mentioned at the top of this post. Among the global ETF portfolios that we track, the Global 60% Equity/40% Bond ETF Portfolio (including both Canadian and global equity and bond ETFs) returned 10.4% in CAD terms when USD exposure was left unhedged, and 13.4% if the USD exposure was hedged. A less volatile portfolio for cautious investors, the Global 45/25/30, comprised of 45% global equities, 25% government and corporate bonds and 30% cash, gained 8.2% if unhedged, and 11.4% if USD hedged. Risk balanced portfolios underperformed in 2017 if left unhedged, but performed well if USD exposure was hedged. A Global Levered Risk Balanced (RB) Portfolio, which uses leverage to balance the expected risk contribution from the Global Market ETFs, gained a 5.3% in CAD terms if USD-unhedged, but had a strong return of 13.6% if USD-hedged. An Unlevered Global Risk Balanced (RB) Portfolio, which has less exposure to government bonds, inflation-linked bonds and commodities but more exposure to corporate credit, returned 5.8% if USD-unhedged, but 11.0% if USD-hedged. In my view, there were four key policy developments that left a mark on Canadian portfolio returns in 2017. The first was the Bank of Canada's poorly telegraphed decision to raise the policy rate. The second was the loosely coordinated move by central banks in June to signal an unwinding of monetary stimulus (at different speeds), which contributed to divergences in relative equity and bond market performances across the major regions. The third was the US Congress' inability to repeal ObamaCare followed by its surprising success in passing sweeping, business-friendly tax reforms in December. The fourth was the Trump Administration's decision to focus its trade policy attention on its NAFTA grievances rather than its complaints about its unbalanced trade with China and other countries. Geopolitical stress associated with North Korea's defiant pursuit of nuclear weapons capable of striking the mainland US also played a role. The impact of these developments can be seen in the chart below which tracks weekly portfolio returns over the course of 2017. After stumbling through Trump's inauguration, portfolio returns were strong into early June. Then "The Great Unwind" began, as within short order the ECB, BoC, Fed and BoE one after another announced less dovish/more hawkish forward guidance and policy rate actions. ECB President Draghi mused about reducing bond purchases. The Bank of Canada, which had talked of the possibility of cutting rates in January, did a quick U-turn and signalled an early rate hike which came in July. In a well-telegraphed move, the Fed raised the Fed Funds target on June 14 and discussed plans to reduce its balance sheet. After cutting rates following the 2016 Brexit vote, BoE Governor Carney signalled the need to raise rates despite the ongoing uncertainty around the Brexit negotiations. The net result of the central banks' Great Unwind guidance was to push up bond yields and push down the US dollar. The impact on portfolio returns is clearly shown in the above chart. All portfolios suffered from early June through Labour Day. The Canadian dollar surged as much as 10% and bond ETFs faltered. This hit the global risk balanced portfolios hard, with the Leveraged RB portfolio taking the biggest hit. By Labour Day, with North Korean tensions at their peak, with the US Congress' failure to repeal ObamaCare, and with dim prospects for meaningful tax reform, year-to-date returns for Canadian investors in Global ETF portfolios had shrunk from the 6 to 8% range in early June to the +2% to -2% range. The final four months of 2017 saw the losses recouped. Trump cut a deal with Democrats to avoid a government shutdown. US-North Korean tensions peaked without further escalation. Global growth continued to surprise on the upside, but inflation failed to accelerate. ECB and BoJ asset purchases continued apace. US tax reform negotiations gained momentum and, though messy as usual, culminated with the passage of the most sweeping tax overhaul since Ronald Reagan. Meanwhile, after two rate hikes in July and September, the Bank of Canada adopted a more cautious stance. With the economy slowing and NAFTA negotiations going nowhere, the Canadian dollar weakened a bit in 4Q17. The result was a strong recovery in global ETF portfolio returns led by US, Japanese and Emerging Market equities. As we enter 2018, the interesting question is whether "The Great Unwind" of unconventional monetary policy will proceed and possibly pick up pace. The results of 2017 suggest that in periods when withdrawal of central bank stimulus accelerates, bond yields tend to rise and currency moves tend to reflect how aggressively central banks change their guidance. With the most optimistic consensus outlook on global growth in years, it is ironic that the best hope for strong Global ETF portfolio performance for Canadian investors in 2018 would be for Canadian growth and inflation to underperform expectations, thereby allowing the Bank of Canada to withdraw monetary ease more slowly than other major central banks.